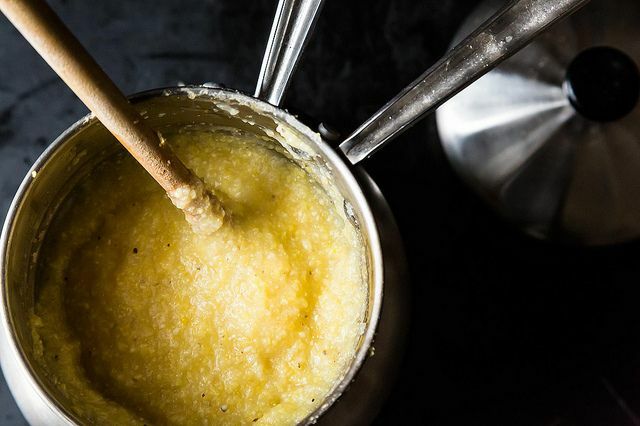 Today: The polenta you can abandon is also the creamiest polenta -- even when you add nothing but water. Somehow polenta got itself a reputation for being needy. We assumed it wanted to be stirred all the time, or it would burn and stick cruelly to the bottom of the pot. And when we agreed to helicopter-parent it, stirring dutifully with our wooden spoons, it sputtered and spat at us. And it lumped! It seemed like such a diva that we stopped wanting to deal with it at all, and we started buying it ready-made in tubes (also known, horribly, as chubs). But there's a better way! 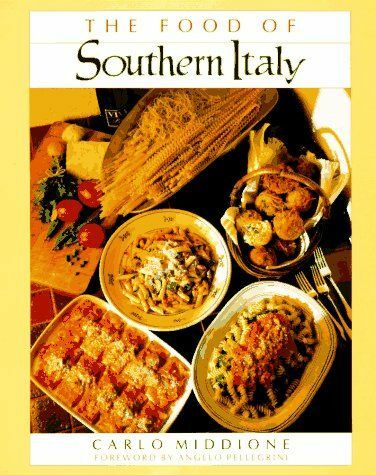 It's a no-nonsense polenta technique familiar to Italian restaurant kitchens everywhere -- and this foolproof, well-written version is courtesy of Carlo Middione's The Foods of Southern Italy. You don't need to be stirring continuously for 45 minutes. You don't even need to be paying very much attention. All you need to do is to stir a bit in the beginning, set it over slow-simmering water, and cover it. 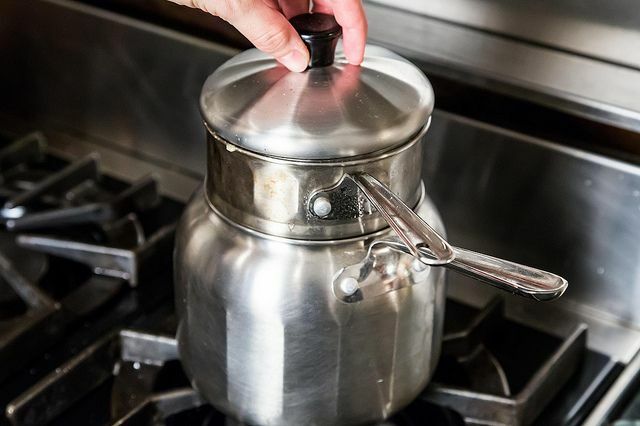 Use a double boiler if you've got it, or just rig up a smaller bowl or pot and cover with foil. It will (mostly) babysit itself for hours. This makes it perfect for a dinner party, or anytime you want to get cooking well before dinner time and go about your business. Better still, as Judy Rodgers observed -- the longer it sits, the better it gets. Any bitterness fades; every gritty grain swells and turns to cream. You can make it with stock, or add milk or cream or cheese, but even straight water polenta will taste better than it has a right to. Like any ill-behaved child, all it needed was a time out. Some years ago there was a small restaurant in the Bay Area that served the best polenta concoction I've ever had: very creamy polenta with a dollop of pesto in the middle of the bowl and with thinish slices of cheese (gruyere?) and tomatoes around the edges. I've made it a number of times but never gotten it quite right; this method just might do the trick! Doing it this weekend. 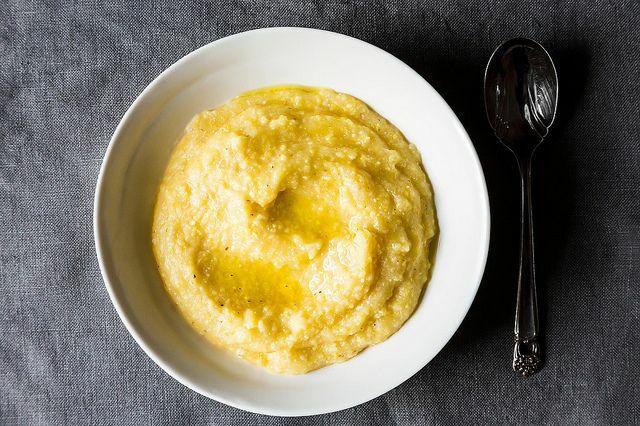 What's the dif between polenta and grits? Ha, I googled to find my favorite easy oven baked way and found my own comment on food52.com help line. This is from chef Gary Danko as published in the San Francisco Chronicle Cookbook back some time. Preheat oven to 350F. Heat 4 Tbsp olive oil in a heavy pot. Add 1/2 cup minced onion. When translucent, add 1 cup of polenta and stir to coat with the oil. 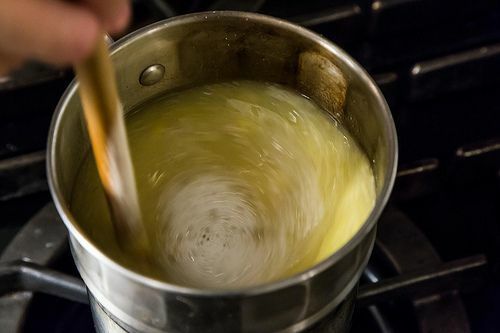 Gradually add 6 cups of boiling water, measured after it boils, while whisking. Add 2 tsp salt. Bake for 35 to 45 minutes. Whisk after removing from oven. It will mound slightly. Serves 4 to 6. Of course it will continue to firm as it cools but he says you can keep it warm and loose in a water bath to hold for up to several hours. Polenta has been a staple in my kitchen for -ever! I use Joyce Goldstein's method of adding polenta/salt to cold water and heating while stirring and have never had a lump. I also cook in glass which holds temperature very steady, turn it way down until it's thick, turn it off and plop a lid on until we're ready for it. Easy-peasy! Kristen, this is awesome. It is so true that the longer it sits the better it tastes. The same applies when making my grandmother's vegetable soup recipe. Letting sit and cook just makes the taste worth the wait! Chubs are still great for grilling. Brush each side with olive oil (infused with lemon, rosemary and garlic is even better) and get some nice gill marks on them. Sounds very good but i think Russ Parsons' version which was featured in the LA Times on 2/18/2010 is even simpler and I've been baking my polenta ever since.I highly recommend the article. 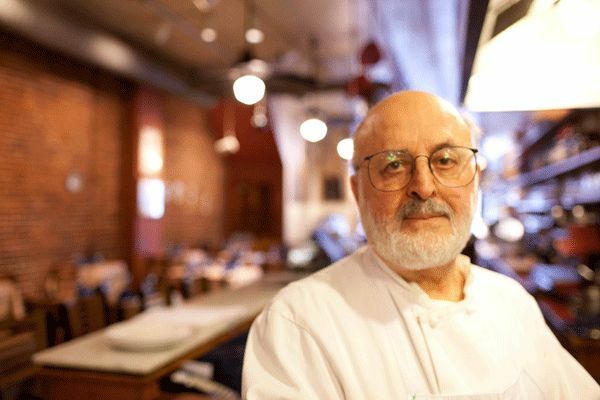 don't know how to link things properly but anyone interested can just google Russ Parsons polenta. 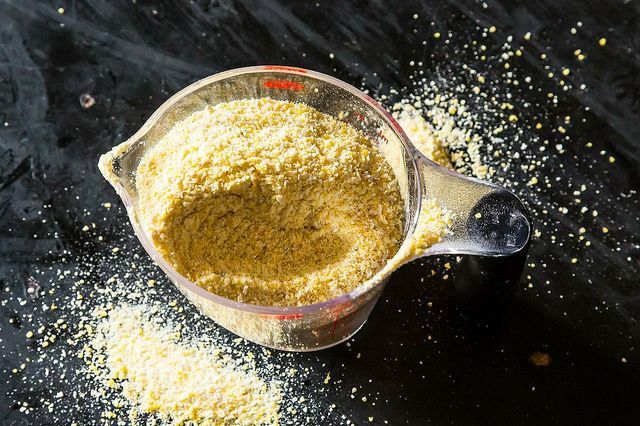 We use polenta in the Carribean and just call it plain old cornmeal. One way we do it use it for is porridge for breakfast.Now if it is cooked the proper Carribean way, you would use cows milk, condensed milk, evaporated milk, brown sugar, fresh nutmeg, cinnamon sticks and vinalla. You would bring it to the boil and gradually add the other ingredients and put the lid on and then make it to your own thickness. However being that it is from the Carribean, each household has its own version. So with allergies and sensitivities etc, you could make it with almond and rice milk etc, sweeten it with stevia etc and then flavour it with the above spices depending on taste. I dream of this polenta. polenta... yum... but what I find more interesting is that pot! 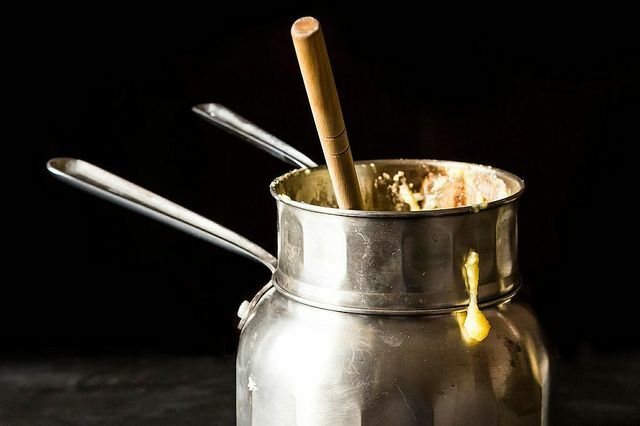 where can I get a double boiler like that?! Brilliant! I'm never buying "chubs" again. I cook my rice in a double boiler and never worry about burning it, too. Love the idea of using cheese whey! It can also be made in a microwave very easily. "You think you're better than us?" hahahaha Thanks for this. 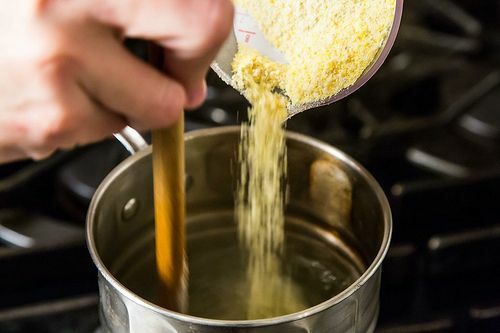 I took a cooking class in Italy, and she taught me to stir the polenta in the water on the stove (to remove all lumps) and then heat to a simmer, and then reducing and adding more water, broth or milk over time if the mixture became to thick. I have never had problems with lumps. I found a recipe a while back for making polenta in the crock pot-it's no fuss as well. I am also wondering how it would work to cook it like the steel cut oatmeal recipe I found on this site. Water bath in the crock pot - may give that a go just to see what happens. I hate stirring for long periods of time. Fine cooking once published a recipe for polenta made in the oven, and it is the one I have always used since there is no stiring involved, and little chance to burn.